This is a die-cut Waverly Motor Oil porcelain sign. This particular Waverly Motor Oil sign is red and white with blue and red text. 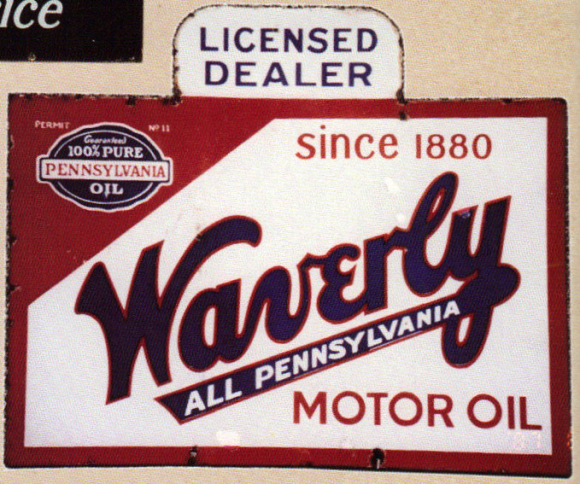 It reads, “Licensed Dealer, Since 1880, Waverly Motor Oil, All Pennsylvania, Guaranteed 100% Pure Pennsylvania Oil” and features a blue Pure Pennsylvania Oil emblem in the upper left corner of the sign.